A true Renaissance man, Francois A. “Doc” Gilfillan inspired colleagues and students alike. He served the College of Science as dean from 1938 to 1962, and OSU as acting president from 1941 to 1942. Doc Gilfillan dedicated his professional life to scholarship and science at OSU as a faculty member in pharmaceutical chemistry. During his administration as dean, the College gained stature because of his work to establish many new programs in research and education. He was fluent in German, Russian, French, and Italian; studied Latin, Greek, and Japanese; and knew ancient Sumerian and a few NW Indian dialects. His love of learning led him to explore new knowledge all his life. In his memory, his family established the F.A. 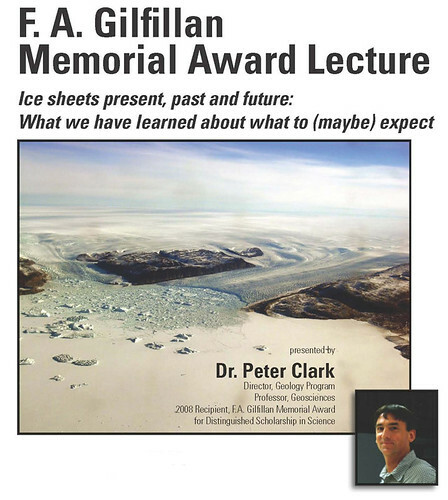 Gilfillan Memorial Award for Distinguished Scholarship in Science. The purpose of the award is to recognize distinguished scholarship in science by honoring a faculty member in the College whose scholarship and scientific accomplishments extend over a substantial period of time at OSU and are widely recognized by peers. The winner of the award receives a plaque presented at the annual College of Science Faculty and Staff Awards Day, a stipend, and an opportunity to present their research in a public lecture.